We have a PayPal link!! 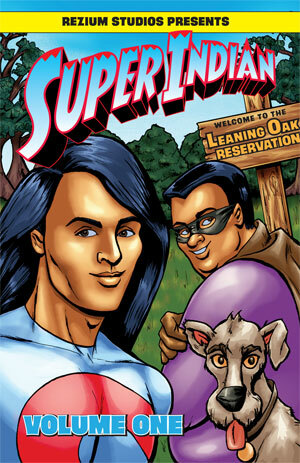 Just got back from Phoenix Comic Con where “Super Indian Volume One” was a hot seller. For those of you who couldn’t join us, we have added a PayPal link for you to buy your very own copy of SUPER INDIAN VOLUME ONE. The book is priced at $19.99 plus $3.00 shipping. Check our BUY SUPER INDIAN STUFF link….or just get your book here. The book is a paperback, sized 6.625″ x 10.25″ with sixty-four full color pages. Included are all the stories you’ve been reading here on superindiancomics.com — “Here Comes The Anthro,” “Hubert’s Blog” and “Technoskin.” Also included are several exclusives including “Real Super Indians” featuring Jim Thorpe and Maria Tall Chief, plus a Rez-Speak dictionary and quick character bios. There are very limited copies and we expect the books to fly off our shelves. Order soon to make sure to make sure you’re the first on your Rez to own a copy of “Super Indian Volume One.” We’ll have an Amazon link for you as soon as they get us set-up.